If the goal of the Desert Twilight Festival is to assemble a competitive field aiming to gauge their chances at qualifying for Nationals along the meet's regional course then, then based on previous year's times, I am led to have a lot of confidence in any boys' team that can average their runners around 15:30 or less along the Grande Sports Academy course. At last year's meet we witnessed five boys' teams averaging under 16 minutes over 5km along the Grande Sports World Golf Course, led by one the best Arizona boys' teams this has seen in over three decades. Though the Colorado and Idaho athletes have the advantage of training in high altitude, those from Arizona will remain confident as they toe the line at 9pm in 90 degrees. Can Arizona hold its own against our guests from north? 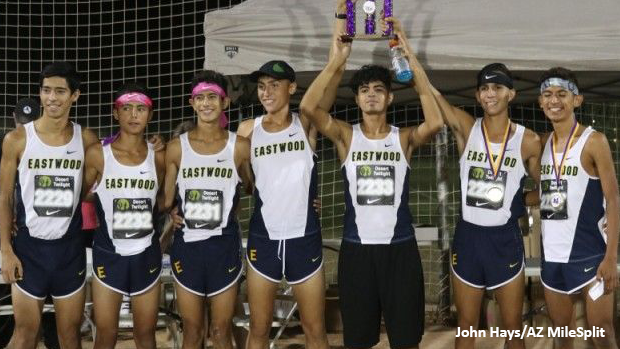 Have a look at our boys' team picks to finish top-five in the Sweepstakes category at Desert Twilight!